I think the property is beatifulsubmitted by Bryan L. - Feb 05, 2018 |Recommended: YesIts quiet and almost like having a house. The dog park is a big plus. Nice Apartmentssubmitted by Zhifu Z. - Feb 01, 2018 |Recommended: YesVery good community with a lot of space. We were very happy heresubmitted by Crystal H. - Nov 28, 2017 |Recommended: YesWe were very happy with the location, the property, and the staff. 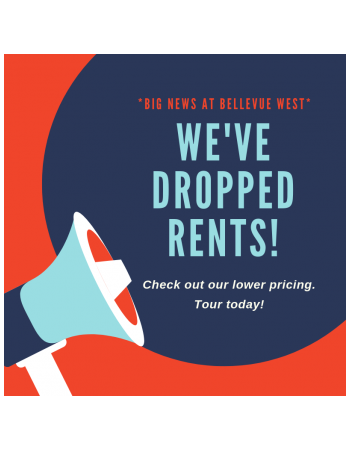 Great Place to Livesubmitted by Matthew M. - Nov 23, 2017 |Recommended: YesBellevue West has been a great place to live. Friendly, helpful, and kind staff who go above and beyond to ensure that their residents are happy and safe. Have truly enjoyed living here. Fairsubmitted by Taylor V. - Jan 29, 2017 |Recommended: YesStaff is pretty friendly, the apartments are not what they're advertised to be. Great layout, but constant ownership change has caused downfall in life heresubmitted by Andrew K. - Dec 24, 2016 |Recommended: NoI love the layout of apartment, and price on par with Nashville, but ownership has changed 3 times since I've lived here over past 4 years. This has caused multiple issues, such as maintenance to lose effectiveness, personal information to be lost, grounds to lose appeal. They are working to make grounds look better, no doubt, but leaks in apartments cannot seem to be fixed, so constantly have water coming inside when it is raining. Also, had no mailboxes for 3 months while they replaced them throughout complex. The office staff has always been friendly and professional, and it is obviously not their fault for the changes, so I have no complaints about their work. Great living place.submitted by Ehtesham K. - Dec 17, 2016 |Recommended: YesIt is a great place to live and to call home. Specially landscape is very nice. My kids love ducks but I know in certain areas there is much noise and crap due to ducks. Community in general is very nice and friendly. Some people are careless about cleaning after their dogs and admin is not particularly strict about it which is is the big one I don't like. Staff is very nice and maintenance has improved since admin is changed this year. Reasonablesubmitted by Kristy P. - Oct 02, 2016 |Recommended: Yesi would tell them that i live here because it is convenient and pet friend but maintenance is horrible and the office staff isn't helpful simply because they just don't know how to fix issues when i have a problem. Never the less they are nice people.